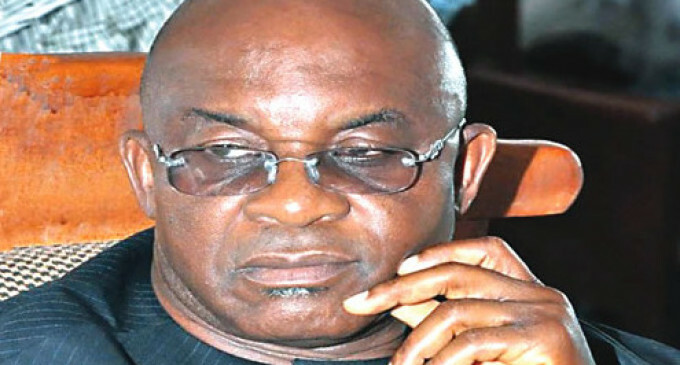 The Federal Government has accused a former Senate President, David Mark, of illegally acquiring his then official residence as his private property. In September this year, the government, through the Special Presidential Investigation Panel for the Recovery of Public Property, which is chaired by Chief Okoi Obono-Obla, gave the former Senate President a 21-day notice to quit the mansion. But Mark had quickly filed a suit before the Federal High Court in Abuja to quash all steps taken by the panel to evict him and recover the house from him. The case has not been heard. Our correspondent, on Monday, obtained from court sources, copies of documents, including exhibits, filed by the former Senate President in his suit challenging the recovery process. The Senate President’s official residence is sited on 1.6 hectares of land at 1 Musa Usman Street, (also known as No. 1 Chuba Okadigbo Street), Apo Legislative Quarters, Gudu, Abuja. According to title documents, the property comprises eight structures, made up of the main house, ADC/chief security detail’s house, guest chalet, security/generator house, boys quarters, security post, driver/servants’ quarters and chapel. The eight structures are said to be properly spaced and linked with well-paved drive and walkways and further done with lawns. Mark, the senator, currently representing Benue South in the National Assembly, is accused of illegally acquiring the property with the approval of former President Goodluck Jonathan despite that such property was excluded from the monetisation policy of the Federal Government. Copies of correspondences and other documents, leading to the purchase and eventual handover of the property to Mark in April, 2011, showed that the serving senator purchased the property at a “reserved price” of N673,200,000. Meanwhile, in his letter, dated October 28, 2010, seeking the then President Jonathan’s approval for the sale of the property, the then Minister of the Federal Capital Territory, Mr. Bala Mohammed, had indicated that the open market value of the property was N748,000,000. Exempted from this arrangement are the official residences of the Senate President, the Deputy Senate President, the Speaker of the House of Representatives and the Deputy Speaker. In justifying the request for the then President’s approval for the sale, the former minister noted that all the houses in Apo Legislative Quarters, with the exception of the official residences of the four principal officers of the National Assembly, had been sold to the legislators occupying them at the time or the general public, under the Federal Government’s monetisation arrangement. The then minister had stated that the Senate President’s residence had an open market value of N748,000,000; the Speaker’s N670,000,000; the Deputy Senate President’s N458,000,000; and the Deputy Speaker’s N348,500,000. What appeared on the then minister’s letter as Jonathan’s hand-written approval of the request dated November 15, 2010, read, “Para 6 and 8 approved. Also see if this could be gazetted. By a letter, with reference number PRES/83/FCTA/18 and dated November 18, 2010, Jonathan conveyed his approval to the then minister’s request for the sale of the Senate President’s official residence. The letter, addressed to the FCT minister and titled, ‘Re: Sale of Residential Houses Occupied by Leading Principal Officers of the National Assembly’, was signed by the then President’s Senior Special Assistant (Admin), Matt Aikhionbare. But by a letter with reference number SPIP/INV/2017/VOL.1/17 and dated September 5, 2017, the Obono-Obla-led Special Presidential Investigation Panel for the Recovery of Public Property insisted that Mark acquired the “national monument” in clear breach of the monetisation policy of the Federal Government. But Mark, through his lawyer, Ken Ikonne, filed the suit marked FHC/ABJ/CS/1037/2017 before the Federal High Court in Abuja, insisting that he legally acquired the property through a “walk-in bid” at the behest of the FCTA. He also contended that the recovery process initiated by the Federal Government was unconstitutional. The Attorney General of the Federation and Obono-Obla are joined as respondents to the suit. According to the former Senate President, the FCTA had insisted that the reserve price of N673,200,000.00 reflected the open market value of the property. He added that the valuers of the FCT that inspected and carried out a valuation of the property had put the “replacement cost” of the property at N492,700,000. He said he duly accepted the offer on April 21, 2011 and paid the “agreed purchase price to the Ad hoc Committee on Sale of FGN Houses” on April 27, 2011. He said the house now served as his family home in Abuja. But he said surprisingly he was on October 9, 2017 served a letter of investigation activities dated September 5, 2017, by the Okono-Obla-led panel.